Participants: A.K.A. "The Vandenberghe Concerto"
Despite the endless noodling with the human psyche that is game design, professional game designers tend to be unfamiliar with models and research in the realm of psychology. Likewise, psychology research has little contact with how professional game designers go about their craft. This workgroup has attempted to pull together a practical and exhaustive hypothesis for player motivation from novelty to nostalgia using the best available scientific models and thinking and present these in a way that will be palatable to practitioners. First, a caveat. We are attempting to take an ephemeral and burgeoning field of research and reduce it and simplify it. As armchair enthusiasts, what is here is not peer reviewed, but is a great way to think about the science that is peer-reviewed. This paper seeks to present the current best models of player motivation that we have, in a way that expresses their role in every moment of play, from novelty (first-contact) to nostalgia (memory). First, let's talk about the best psychological models. Why do we play what we do? Why do some people like Farmville and some people like Dark Souls? It’s an incorrect flippancy to say that some people are “right” and some people are “wrong”. We play for a variety of different reasons. Jason Vandenberghe theorizes that the motivations for which we play are much like the motivations for which we do other things, which psychology has thoroughly studied. Vandenberghe has created a great primer on what psychology calls “the big five model of motivation” and how it applies to play. The Big 5 as a model does an excellent job of predicting taste. What genres of games and what styles of play you prefer are well-described by the Big 5 model. However, in a 2006 paper entitled "The Motivational Pull of Video Games", Rigby and Ryan demonstrate that the Big 5 does a poor job of predicting long-term satisfaction in games. So, in our model, we postulate that a player's Big 5 type relates to the acquisition phase of game engagement, and also points the way for the reasons why people will quit playing (rejection). Self-Determination Theory: Why are we unsatisfied? Self-Determination Theory (SDT) is a hugely successful theory of satisfaction that grew out of something called two-factor theory, which broke human motivators into extrinsic and intrinsic motivators. SDT took this one large step forward and declared that intrinsic motivation comes in only three categories: mastery (the experience of getting better at life), autonomy (the experience of making choices and learning about yourself through those choices), and relatedness (the experience of learning how others see you and finding your place in the world). Actions that have a high potential in these three categories have a better chance of being actions that people will be intrinsically motivated to do. While there is a lot more we could say about SDT, for the purposes of this paper it is enough to say that it is a key theory of psychology with a large body of work behind it. Speaking of large bodies of work, over the past 10 years, SDT has been translated into game design principles by Scott Rigby (of Immersyve). Scott's model is known as PENS (Player Experience of Needs Satisfaction), and has been presented widely (here is a good article for introduction: http://www.gamasutra.com/view/feature/130155/rethinking_carrots_a_new_method_.php). This makes the work of attempting to apply SDT, um, slightly easier. Thanks, Scott! You are a god! Drives: What do we want? The third major area of psychology that has a large body of science behind it is a collection of theories often generally referred to as drive theory. Drive theory proposes that we have inside of us needs that wax and wane, and the experience of these needs drive people into action. There are many types of drive theory. We have chosen to work with a recent theory by Professor Stephen Reiss, which he has called "The 16 Basic Needs". To be clear: the body of work behind these types of theories is not as extensive as with the other theories, and so a certain amount of estimation is necessary to put these models into application (for now), but the overall concept of needs has been well-demonstrated by research. The 16 basic needs proposed by Reiss are: Acceptance, Curiosity, Eating*, Family, Honor, Idealism, Independence, Order, Physical Activity, Power, Romance, Saving, Social Contact, Social Status, Tranquility, and Vengeance. ”Big 5” theory is helpful for determining why people play, but is less useful for explaining why people continue to play or why they quit. It helps us to bring players in. The player chooses to engage with your game based on the facets of Openness, Conscientiousness, Extraversion, and Agreeability. If what your game offers does not match with the personality of the player, they won’t even try to engage with your game. This is represented by the left side of the figure above. Once the player decides to engage, “Big 5” doesn’t predict behavior as well. We don’t change our “Big 5” factors during a game, so “Big 5” should predict that we continue to play the game forever as long as the game still has those attributes which attracted us in the first place. However, we know that is not the case in reality. We believe that play motivations are best described by two theories in conjunction: Deci & Ryan’s Self-Determination Theory, and Goal-Setting Theory, which is attributed to Locke but informed by Piaget’s processes of accommodation to and assimilation of goals. When we decide to engage we set goals, engage with the game through play, and then evaluate our progress towards the goals and what that process has done for us. 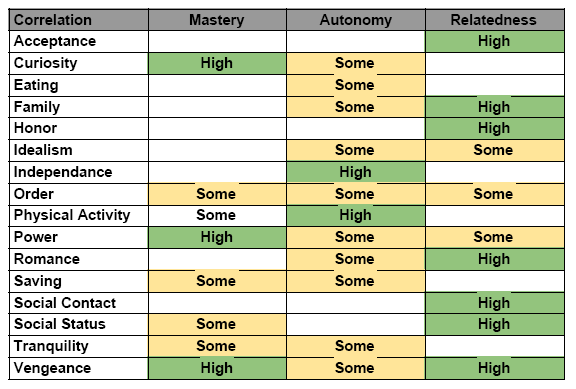 We examine that through the lens of the three factors that Deci and Ryan say we all value: mastery, autonomy, and relatedness. If we are satisfied in these areas, we will continue to set and adjust to new goals. This continues in a loop until the player stops engaging. However, there are conditions in which we choose to not continue engaging with the game. This can happen at the goal-setting step or the engagement step. During the goal-setting step, the player may quit because they cannot meet the goals in the ways Piaget mention: either the player cannot assimilate the possible goals to his/her desired play or the player cannot accommodate to the necessary goals. A third reason for ejection at this point is that there are simply no goals that can be made. If this is the case, the player will necessarily stop as there is nothing directing their behavior. During the engagement step there is a wide-ranging array of reasons the player might quit and these can be explained by a number of theories. The lone outlier in the “Big 5” model is Neuroticism. It doesn’t explain why we play but instead why we stop playing. If there is a trigger of one of these neurotic attributes: anxiety, anger/hostility, depression, self-consciousness, immoderation, or vulnerability, then the player will quit. Jenova Chen also provides an explanatory tool by the application of Csikzentmihalyi’s Flow theory. This states that a player oscillates between extremes of boredom and frustration. If the player stays between these, he/she continues and may be in flow. If not though, he/she may quit. Additionally, there may be violations of expectations or norms that cause a player to eject from the experience. These expectations could be personal (I thought the game would be X, but now it is Y) or they could be sociocultural (This game glorifies violence and I will not continue). Finally, players may quit for physical reasons. Either they no longer have the time or energy to play. Or the game may ask money of the player that he/she is not willing or able to spend. There may be other ejection criteria. But these seem to be either explained by concrete events or established theory. It’s best to explain a complex system in terms of other complex systems that we already understand. What we discuss below is not a simile, but a metaphor. We use the metaphors below as a way to relate the heavy concepts in a way that is relatable. It’s important to note that we are not saying that these concepts are literally what we explain below but that it is a rhetorical tool for explanation. We are using the metaphor of a pen-and-paper role playing game’s character sheet. Because these eight things relate to our largely static facets of our motivations, these things can be seen as RPG attributes like Strength or Wisdom. This makes archetypes of players equivalent to classes. In an RPG, the Warrior generally has high Strength and low Intelligence and this leads to certain behaviors. They are the ones to attack the big boss and stand on the front lines. Likewise, our players have a “character class” of sorts that is defined by their attributes here. We equate the concept of drives to skills in our RPG. Each player will have a different interest level in each drive, much like different characters have different levels in skills. Drives are effectively the tools that designers can use to construct their 'encounters' for players by targeting specific drives that the player can respond to. Finally, we have the three elements of self-determination theory: Mastery, Autonomy, and Relatedness. According to the theory, these are universal and we all want to acquire them as much as possible. Sometimes we want more of one than the others but we pursue all of them. The metaphor here is that of different types of experience points. Someone who has twenty years of experience in first-person shooter games will play a new first-person shooter very differently than a complete newbie when it comes to acquiring mastery. If the veteran doesn’t get new opportunities to hone mastery, he will leave, while the new player may not need those higher-level challenges and can hone mastery just by learning the basics. These three items are the carrots that all players chase and if we can supply them with these ephemeral qualities, we will create an experience that they will want to stick with. 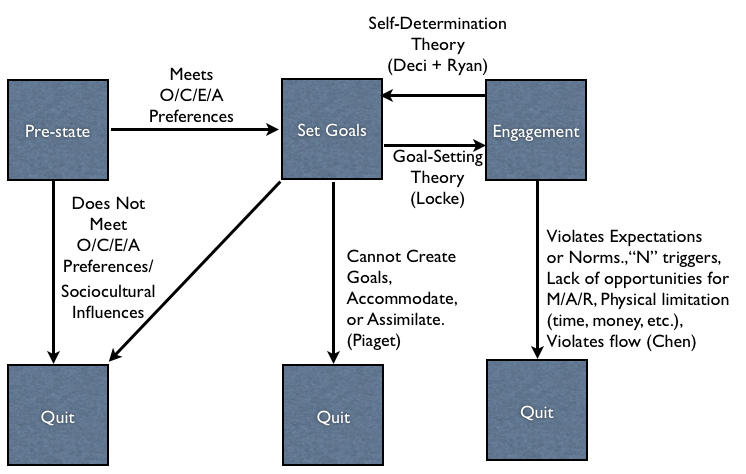 self-determination theory. While this isn’t yet confirmed experimentally, it seems important to note that these may not be wholly independent. Players buy in to a game when the expected level of satisfaction justifies the time and effort required to play. The point of acquisition is when a player first buys into a game. During play, opportunities to set, meet, or violate player expectations arise. This illustration shows how player buy-in is affected. As expectations for future satisfaction increase, so does the player's buy-in. 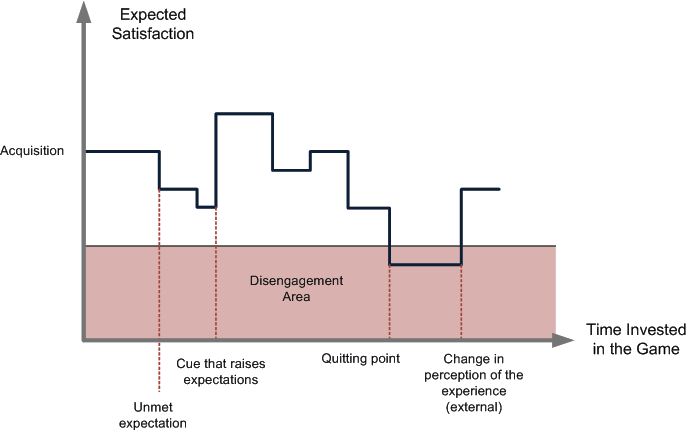 As expectations decrease, the player's buy-in decreases, until eventually the player disengages from the game. 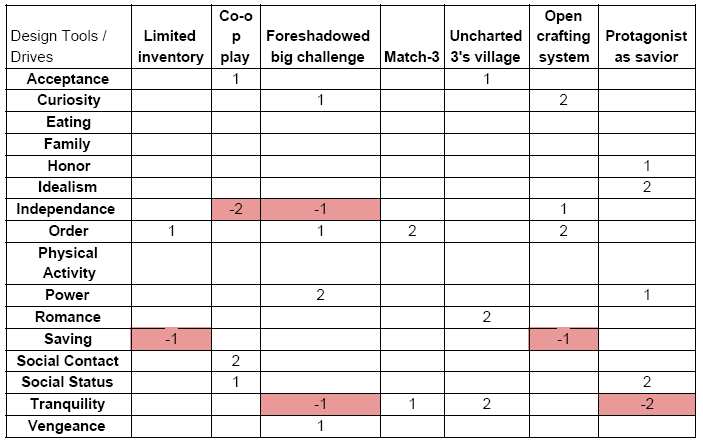 Giving the player in-game cues which point out these game elements increases buy-in, as the player's expectations for satisfaction are raised. Chen, Jenova. "Flow In Games (and Everything Else)." Communications of the ACM 50.4 (2007): 31. Print. Vandenberghe, Jason. (2012). GDC 2012: Applying psychology principles to game design. Accessed from http://www.gamasutra.com/view/news/165358/GDC_2012_Applying_psychology_principl es_to_game_design.php on 9 November 2013.